Local chapter of premier global business network, Entrepreneurs’ Organization (EO), will be hosting a learning session this January 23, on building and measuring innovation programs in businesses, with renowned speaker, Craig Rispin. In the 2014-2015 release of the Global Competitiveness Report published by the World Economic Forum (WEF), data revealed that the Philippines has improved its business sophistication rising from 49 to 46. This growth has noted that large companies, and small and medium enterprises (SMEs) operating in the country were able to employ strategies that have allowed them to overcome challenges. This rings true with the release of the recent Global Entrepreneur Indicator (GEI) by the Philippine chapter of EO where 73.33% of local businesses reported to have gained an increase in revenue from 2013. Entrepreneurs remain upbeat predicting that further business growth will be achieved in the next 6 months. “While several businesses have proved to be able face changes in the market, there are still those that find it difficult to craft and execute strategies that would enable them to yield positive results,” says TJ Parpan, Marketing Communications Chairperson of Entrepreneurs’ Organization. 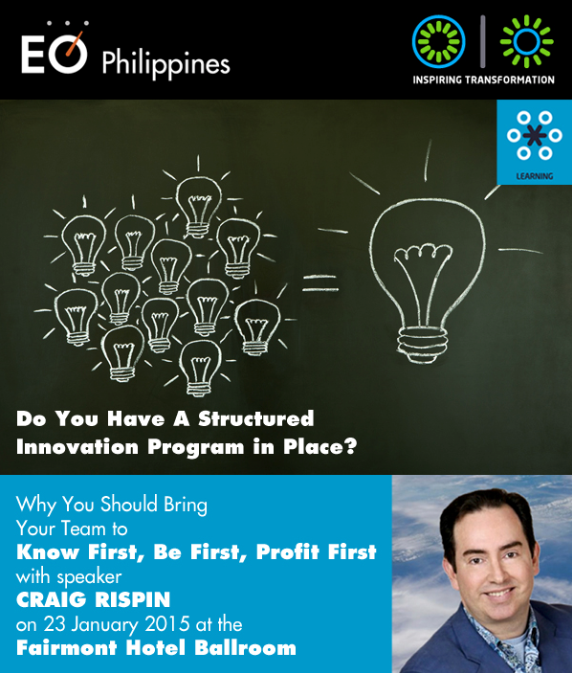 Recognizing the need for local businesses to create innovation programs to thrive in fast-growing markets and industry, Entrepreneurs’ Organization (EO) Philippines will be hosting a one-day learning program with sought-after Certified Speaking Professional, Craig Rispin. The Business Futurist and Innovation Expert has gained over 20 years of experience being a key consultant to some of the world’s largest and leading firms including P&G, Mercedes-Benz, Pfizer, and Hewlett-Packard, to name a few. Some of his achievements include launching the first TEDx in the world in 2009 and being among the few to be considered as a Certified Speaking Professional, a title held by less than 10% of speakers globally. The whole-day session, themed ‘Know First, Be First, Profit First,’ will enable attendees to learn the critical components in creating a successful innovation program and measure the success of their strategies. Participants will gain an in-depth knowledge on business, people and technology trends transforming commerce, and how they impact each other, driving faster change. The program will also enable its attendees to see what the future is like for businesses, and to learn how to inspire people to develop foresight. While it’s a must for entrepreneurs to attend, department heads from companies’ Marketing, Research & Development, Sales and even Human Resource units are highly encouraged to participate. The learning program hosted by EO will be held on January 23, 2015 from 9 a.m. to 4 p.m. For a fee of P3000, one will be able to attend the first ever talk that Craig Rispin will hold in Manila. For more information on the ‘Know First, Be First, Profit First’ learning program, you may send an e-mail to admin@eophilippines.com.